Georgia Bailey is closing up her little charity shop in Oakbarrow when she gets a mysterious late night call from a stranger, threatening to jump off the town’s bridge. Something about the man’s voice is faintly familiar but all she can do is stay on the line and after talking for hours, losing sense of time passing, coax him back from the edge. A heartwarming festive love story that reminds us that even in the darkest of times, hope is always just around the corner! Jaimie Admans’ books are always a joy to read. They’re fun and funny and always have a magical quality and something about them that makes them feel different from anything else I’ve read. 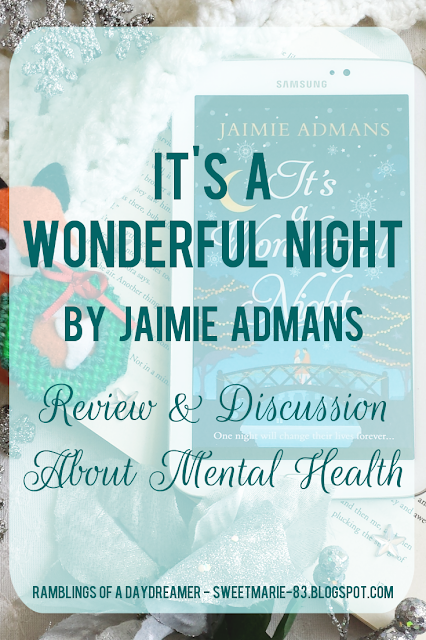 It’s a Wonderful Night had that magical quality I’ve come to love in Jaimie’s books, but the thing that really set it apart was something completely unexpected: the fact it dealt with mental illness. Honestly, take a moment to let that sink in: a romantic comedy that deals with mental illness. I love romcoms and have read many of them, most of which are light, fluffy, feel-good stories. An escape from reality. When you think of those things, you don’t associate them with mental health issues, right? But that’s one of the things that sets It’s a Wonderful Night apart and makes it a must read. Jaimie Admans struck the perfect balance between fun and funny romcom and serious, true-to-life, relatable issues. As someone who has battled with depression since her teens, I’m always on the look-out for books that depict mental illness in not only a realistic way, but a sensitive and thoughtful way, and Jaimie did that. Having that not only in a romantic comedy, but one centred about the holidays, was brilliant. It’s important to talk about mental health all the time, but I think it’s especially important around the holidays because they can be difficult for many people. While some people see the holidays as the most wonderful time of the year and revel in the festivities, for others it can be absolutely miserable. For many people, the happiness of the holidays and getting together with friends and relatives can be exhausting. They feel they have to pretend to be happy because that’s what people expect. Or they see everyone else’s successes - jobs, travel, relationships, children, wealth - and it only shines a light on their shortcomings and failures. Many people also have complicated relationships with their families for a variety of reasons, and since the holidays are generally a time for family gatherings, it can bring on a lot of anxiety and stir up old resentments. Then there are the people who are either alone for the holidays, or feel alone...and the ones who have lost loved ones and the holidays are a reminder of what they’ve lost. Then there are the expectations that come with the season - financially, emotionally, timewise. There are so many reasons the holidays can be a difficult, painful time, and a lot of people bottle it up, put on a smile and a good show of holiday spirit, and meanwhile they’re spending money they don’t have, exhausting themselves with draining interactions, and feeling worse by the day. 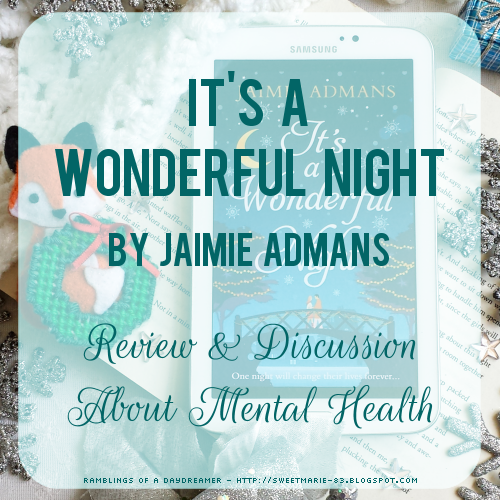 This book shone a spotlight on those complicated Christmas + depression emotions. It didn’t make light of it and it didn’t sensationalize it. It didn’t make it seem like there was a magic cure for depression or that simply ‘getting in the holiday spirit’ would fix anything. Georgia reminded Leo that no matter how bad things get, they can get better and there are things - and people - worth sticking around for. She reminded him about the good things in life and that he matters. He’s important. Life is worth living. It was a beautiful, heartfelt message that rang so true for me and really spoke to me on a deep level. The book wasn’t solely about Leo’s struggles with depression, though. It was also a story about friendship, community, and pursuing your dreams. It was sweet and heartwarming and hopeful. And romantic! I’ve found a new book boyfriend and his name is Leo. He was a perfect example of someone hiding behind a mask - always smiling, kind and generous, but hurting inside. He would do anything for anyone, and put himself last until Georgia came along and showed him how valued he was. I absolutely adored Leo and Georgia, and all the other Oakbarrow residents. These characters leapt off the pages and felt so real. I didn’t want this book to end, and it’s been a long time since I’ve felt that while reading a book. I could picture it all so clearly...which made me realize this would make a wonderful movie. Get on it, Hallmark! 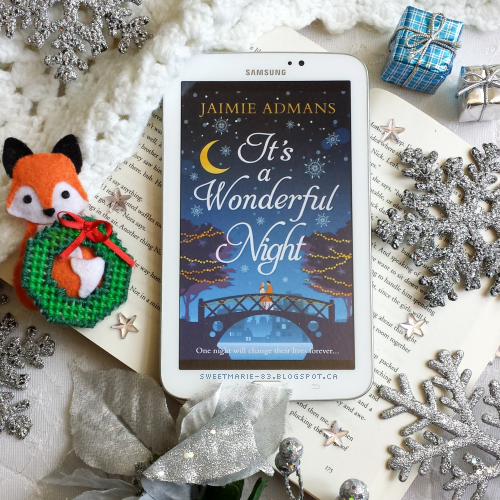 If you’re looking for a sweet, funny, heartwarming read this holiday season - or any time of the year - I hope you’ll pick up a copy of It’s a Wonderful Night. It’s not only a beautiful festive read, it’s also a reminder that even in the worst of times, there’s still hope, and you’re not alone. Are the holidays a fun time for you or do you find them stressful and emotional? Or maybe, like me, you feel a combination of both? Do you have any favourite books that deal with mental health issues? This sounds so good! Really heartwarming, and the fact that it deals with important conversations as well is a bonus. Bookmarking this one on my wishlist! Thank you so much, lovely lady. I honestly thought the first draft of this was the worst thing I've ever written and I can't quite believe that anyone could say such lovely things about it! I'm going to print this review and re-read it every time writing is going badly! I'm honestly blinking back tears as I'm reading this! Thank you, thank you, thank you! I'm a bit of both when it comes to the holidays too. I love love love the build up to Christmas, the festive food and movies and buying presents, but when it comes to the actual day, it's usually more stressful than fun. I would be quite happy if we could have all the build up to Christmas but spread the actual day out over a week or so, it would be much less stressful! You're so sweet! I'm so glad you're pleased. I meant every single word. You just amaze me with each new book of yours. I remember you saying how much you hated this one and you thought your editor was going to rip it to shreds in review. I guess that just proves we really are our own worst critics! Wouldn't that be lovely? It's such a strange thing; Christmas movies and music, the lights and food and decorations, all make me so happy but the actual day is stressful and I end up not enjoying it and then feeling guilty for not enjoying it.